Under the title ‘Emergent Constructions’, the AA Visiting School Kuwait brought together international and local students and professionals in architecture and investigated contemporary methodologies for context-specific architectural design. The program introduced digital design seminars and advanced site mapping methodologies to allow participants to engage with the underlying social and cultural mechanisms of public space. 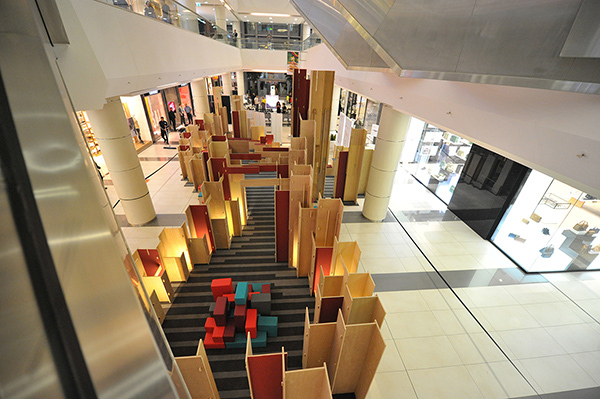 The site information gathered was then used to explore and develop a critically informed architectural intervention, enhancing and enriching the site within the Promenade Mall. Throughout the ten-day program, several different design strategies were combined into a single architectural approach which was further refined to incorporate the characteristics of digital fabrication. The pavilion is constructed using 3-axis CNC routed plywood components that were assembled on site without the need for specialist tools or fixings. The resulting pavilion incorporates spaces for social activity of different size and character. It operates at the scale of human experience, acting as a catalyst for the specific users of the site. As an innovative architectural installation, it explores the possibilities of generative design, and its capacity to incorporate dynamic social and environmental performance qualities. An extensive study was carried out across the site taking into consideration environmental and behavioral factors. 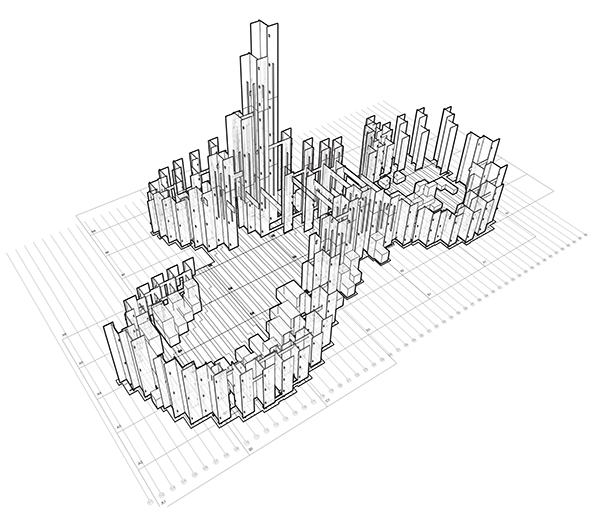 These include studies regarding access and entrances, flow of people, and areas of density. Furthermore, the environmental factors were studied including, noise patterns, direct sunlight, and the views into the site and towards the surrounding amenities. These factors were translated into the design of a pavilion that would create an intervention on the existing site. 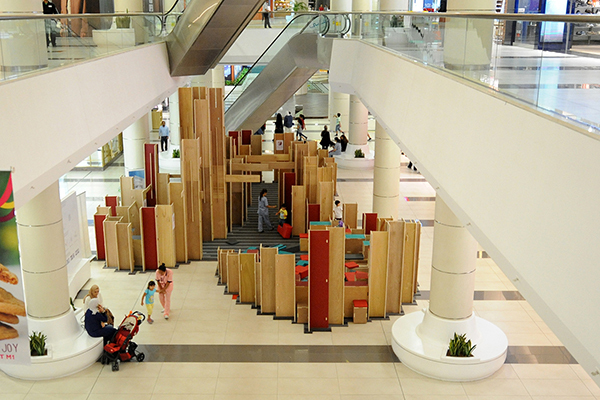 This intervention would generate activity, intervene with general paths of circulation, bring people into and out of the pavilion, and create experiential moments for various types of users. The overall assembly of the pavilion out of a sequence of column-like elements offers the unique opportunity to create spatial perimeter enclosures that are not solid but porous, mediating views and light at specific lines of sight. An orthogonal architectural language is implemented because of the efficient use CNC router paths and economical nesting of different components within the standard plywood sheets. Yet the staggering of column elements in plan creates a louver effect between the internal spaces and the context, offering varying degrees of privacy for the people inside. 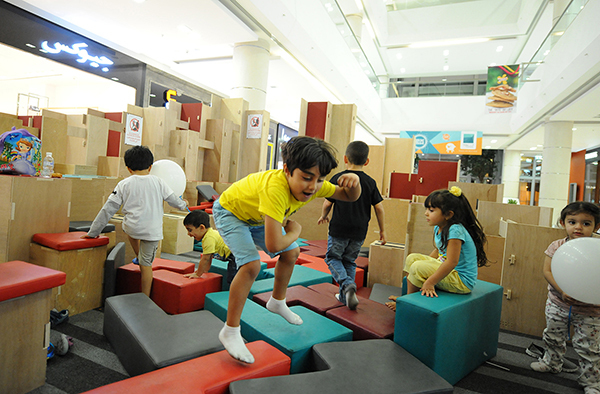 The qualities of space that result cover a range of social interactivity scenarios including private space for a single occupant, and larger group spaces for dynamic social interaction and play. 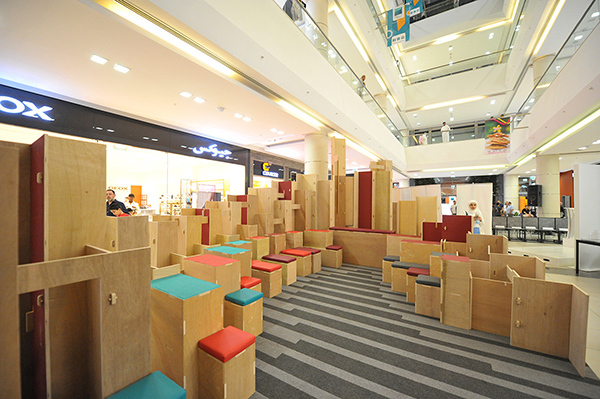 The programmatic possibilities were further enhanced through the incorporation of furniture elements such as benches and stools, constructed out of plywood but covered with upholstered cushions in a range of colors. A digitally designed carpet with varying density pattern was added to indicate the various privacy levels and density of circulation paths within the environment. 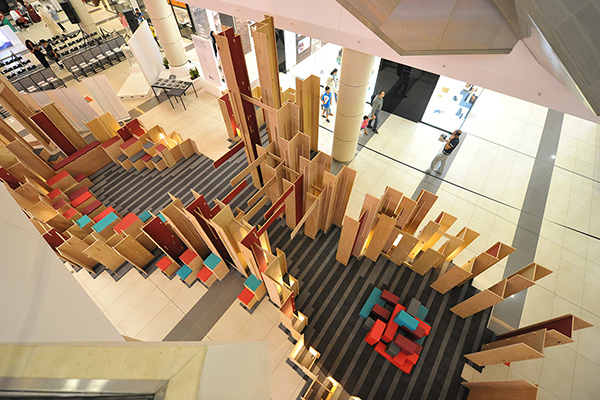 The final result of the generative design and construction exercise is a pavilion that manifest itself as a field condition, distributing a large amount of self-similar elements with varying properties and relationships within the circulation space of the Promenade Mall to intensify and enrich its spatial and programmatic possibilities. The pavilion as a field of elements with different heights, density and functions creates a varied architectural landscape that has specific intentions for stimulating social interaction built into it and specific locations within the site. The multiple possibilities of use and interpretation however allow the users to create their own social patterns and interactions, and explore unforeseen modes of engagement with the design at the many in-between spaces of the pavilion. The role of the architecture is conceived as creating a stimulating environment with a strategic purpose and agenda, without being over-prescriptive or inflexible but creating an open-ended system for appropriation by the users of the mall. The site-specific complexity embedded within this project is made possible through the adaptation of a ‘mass customization’ fabrication strategy. The use of a CNC Router allows for the computer controlled cutting of structural components directly from the digital design. This methodology does not only allow the variation in overall form of the pavilion, it also enables the incorporation of connection details in a precise and adaptive manner. The integration of connection details such as slotted joints or notches and dowels creates an entire different construction workflow than in the traditional fabrication paradigm: construction is no longer dependent on specifically skilled labor, specialized tools or expensive and labor intensive fixings. This methodology allows for the assembly of a complex structure by the end-users, in locations that normally don’t have access to technology. The design development for this project has focused on the efficiency of fabrication and assembly, incorporating criteria such as CNC toolpath optimization and material sheet sizes and economy within the very first stages of the conceptual generative design. Through the architectural language of orthogonal components, the standard plywood sheets of 1220 x 2440 mm are used to their maximum capacity while the amount of waste material in the cutting process is minimized. The assembly logic is also developed to incorporate principles that create structural stability during the various stages of the construction process. Students in the workshop program used extensive digital modeling and physical model-making tests to explore and improve these design principles. Initial development focused on the creation of repeatable and variable components, termed ‘columns’, that could be aggregated to form larger wall sections, spatial enclosures and even integrated other functionalities such as furniture elements. With the use of a laser cutting machine to produce scaled version of the 1:1 assembly system, several joint details were developed and tested for structural efficiency. While slotted connections were initially used to combine multiple panels into a stable column configuration, the length of the elements caused this connection type to be insufficiently strong. As system of several interlocking notches along the entire edges of the panels was devised, creating stronger edge connections and also a simpler joining movement that would be easier to execute at full scale. Using tests at 1:1 in the final material and CNC fabrication process, the joint detail was further tested to make sure the final production process would incorporate the right tolerances for easy and rapid assembly. Several slightly varied connection sizes were tested for the right amount of friction between the pieces, including a detail with a CNC drilled hole which could receive a standard 10mm wooden dowel to lock the connection into place.